It's Fall and our weather today was just so nice, although it was a little breezy. The wind didn’t bother me since I was wearing this really nice and soft summer maxi dress that I got from ROMWE. 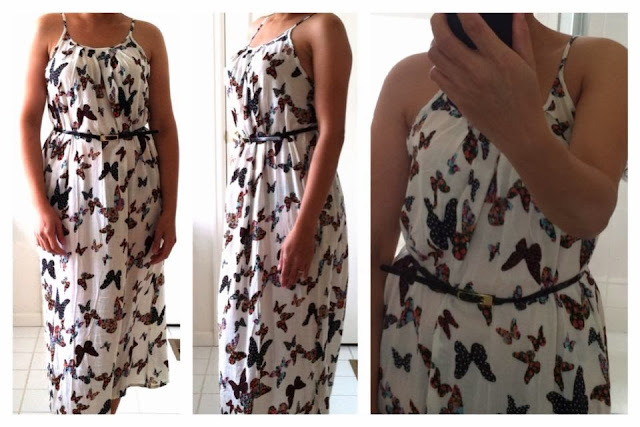 What I love about wearing this Straps Butterfly Print Longline Floral Dress is that it’s so comfortable to wear that I don’t wanna take it off. This dress is really great for going out or for any casual wear. In the next couple of days, it will be getting colder, so this dress would be great to have as a blazer when you go out. Wanna check out this awesome dress for casual wear? Then, I highly recommend you check out ROMWE where you can find the latest street fashion online. Yellow dress, featuring scoop neck and sleeveless with straps styling, butterfly print throughout, pleated detailings, extra long length, soft-touch fabric. Matching with unique hat and flat sandals is a good choice when going for traveling on beach.